I spent the past weekend cycling the Norfolk Coast Cycleway, taking my bicycle by train to King’s Lynn on Saturday morning and returning by train from Great Yarmouth Sunday evening. In exchange for the offering of my weekend and my sore body, I received the privilege of enjoying miles of coastline, living history in every town, and the friendly acquaintance of its residents. Even investing my whole weekend into the trip and covering such a distance, I still felt like I’d only just gotten a small peak at Norfolk. Nonetheless, it was my best cycle yet. As one might suspect from the name “Norfolk Coast Cycleway,” the coastline was one of the highlights of the trip. Despite much of my route being a few miles inland from the shore, many times my vantage point from a hill allowed me a peek at the ocean, and I took some time both days to have a stroll along the beach. Holkham Beach. Click to enlarge. Even if 100 miles is a long distance to cycle in a weekend, it’s quite small on the geologic scale. But surprisingly, the nature of the coastline varies substantially from the north to the east. At Holkham, long spits of sand stretch into the water. Patches of the ocean shimmer with the quality of salt flats, suggesting a silty shallow bottom even at hundreds of yards from the shore. I could see windmills on the horizon, further beyond than where I could see land, appearing to simply stand above the ocean itself. Just a few miles away at Wells-next-the-Sea, sailboats anchored in a marshy inlet. 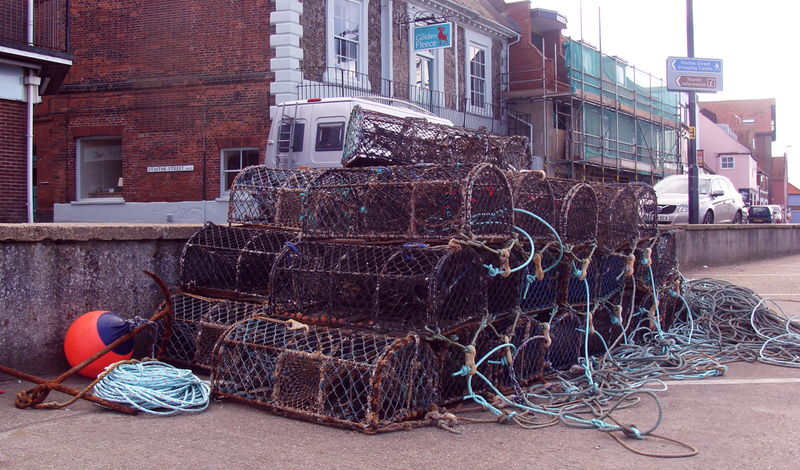 Crab pots sat in a pile along the marina, reminding me of the rites of the tributaries near my native Chesapeake Bay. In Maryland, these two terrains would be separate by hours travel via car, requiring a trip from the bay across the Delmarva peninsula to the barrier island. The next day, I found myself climbing higher and higher as the coast rose far above the waters. By the time I reached Mundesley, wet lowlands had been replaced by high clay cliffs, complete with a light house in Happisburgh to guide mariners safely to harbor. Around Horsey, this then yielded to soft sand dune, topped with shoots of grasses. Here, in the last leg of my journey, signs promised me the reward of spotting some seals. A small industry has arisen around seal watching in Norfolk, with boat trips traversing waterways in the northern nature preserves that host grey seals in the winter and common seals in the summer. It’s yet a bit early for common seals, and unfortunately all my time spent along the water was in at least partially developed locations rather than proper nature reserves, so all I could see were some dark domes bobbing above the low waves. Two ladies with the same mission let me borrow their binoculars for a better look, but with the seals mostly submerged there wasn’t much more to see. 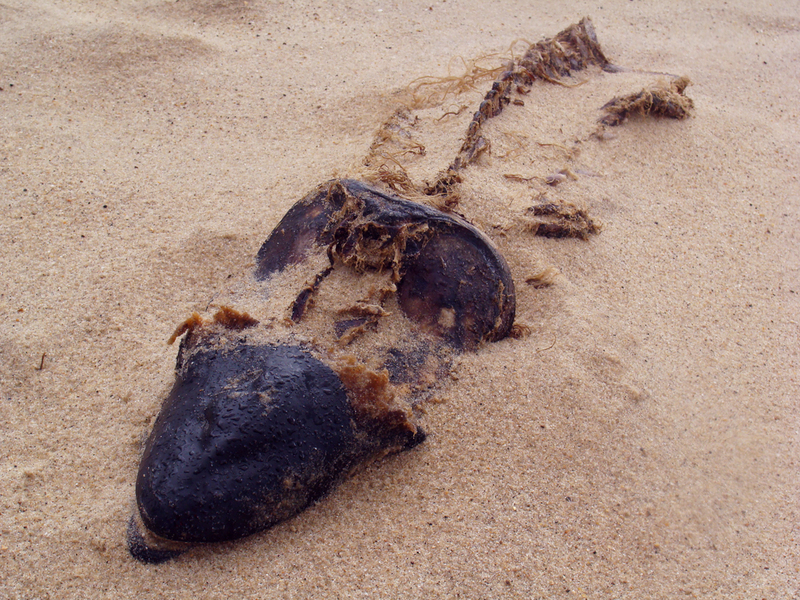 What was on the beach were remains, some of which almost appeared to be more fossil or even sculpture than bone. Exactly what animals left behind such parts wasn’t always clear. While walking through the dunes, I was surprised by the steep descent to the beach, but from the other side the reason was clear. The dunes were buttressed by cement barriers. Much of the coast is eroding, in some spots more quickly than 30 feet a year. While past decades have seen the construction of miles of defense structures, a new approach of “managed retreat” is being considered, allowing some low-lying areas to flood. Much of Norfolk is former salt marsh drained for agriculture, and similar to the fens of Cambridgeshire, the land has subsequently been sinking, rendering over 25 square miles of land likely to flood. Homes that were blocks from the sea five years ago are now slipping into the sea, leading those that remain to be valued at as little as £1. Despite destructive turns of history and battery by wind and water, much of Norfolk’s history survives today. Towering medieval stone churches are so common that I used them as navigational tools several times and as shelter from a nasty bout of rain. But it’s unclear just how much longer some of these historical structures will survive the climate’s escalating hostility. Unfortunately due to a couple wrong turns costing me a few hours of daylight, I didn’t get to spend too much time exploring the rich tidal ecosystems and marshland, meaning I missed out on most of Norfolk’s wildlife. Instead, most of the highlights of this trip arrived via Norfolk’s natives of the two-legged variety. More on that next. This entry was posted in travel and tagged climate, cycling, nature, Norfolk on May 18, 2014 by Dylan Bargteil.